The visitor center, designed to look like a space port, is where Star Trek fans will find some serious items to geek out on. 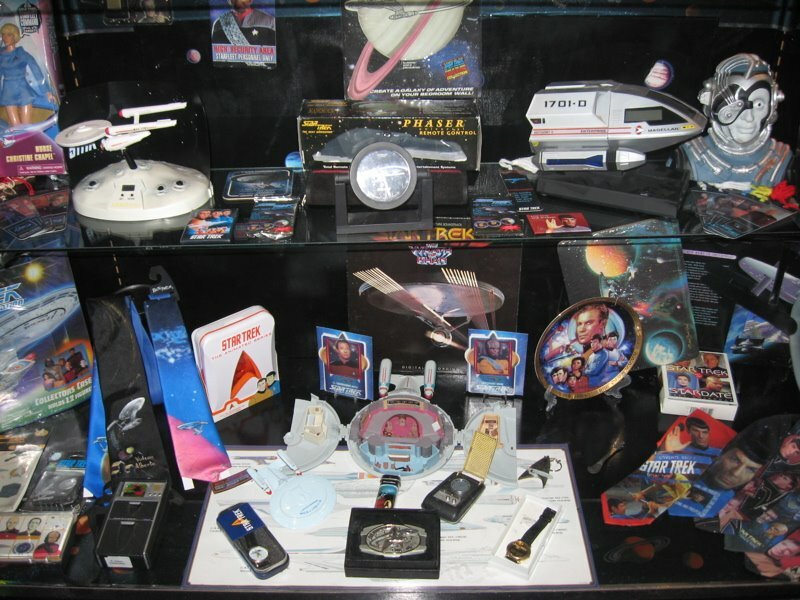 First there's the extensive collection of memorabilia donated by a generous collector. Spock calenders, Captain Kirk mugs, phasers, tricorders, Next Generation phones and alarm clocks fill cases and shelves. 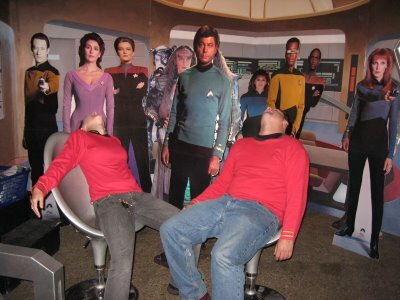 They've constructed a replica of the Star Trek: The Next Generation bridge, complete with cardboard standups of classic and newer characters. 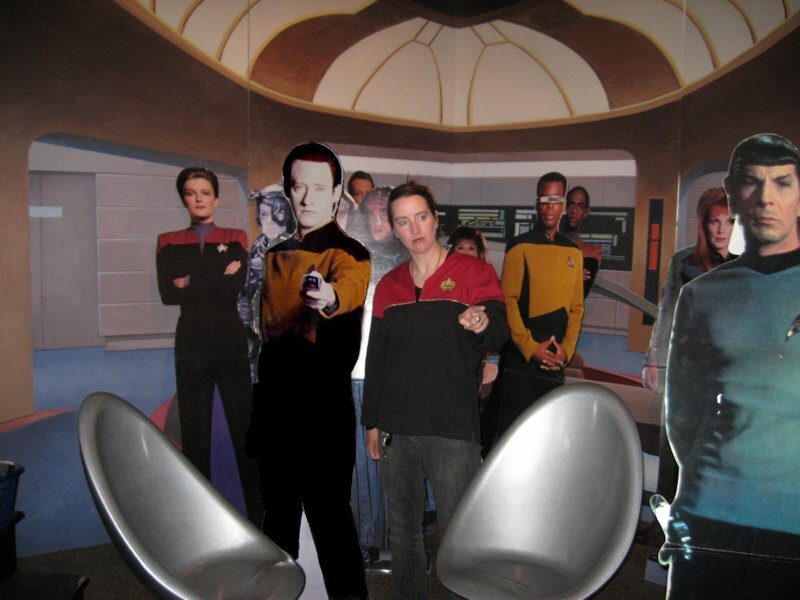 They even have costumes from all the different Star Trek shows that you can put on and then take your photo with the characters. 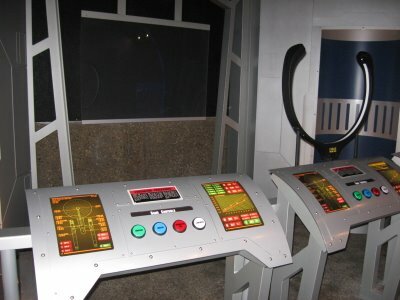 Inside an adjoining room is a $100,000 virtual reality game in which you can man battle stations and blast enemies out of the sky. The town as a whole even has a few alien-themed signs which I thought were awesome. 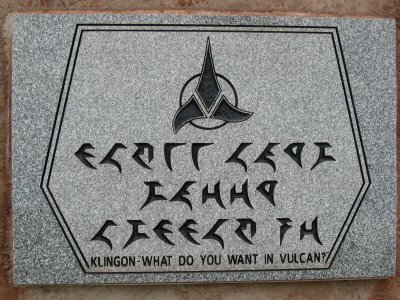 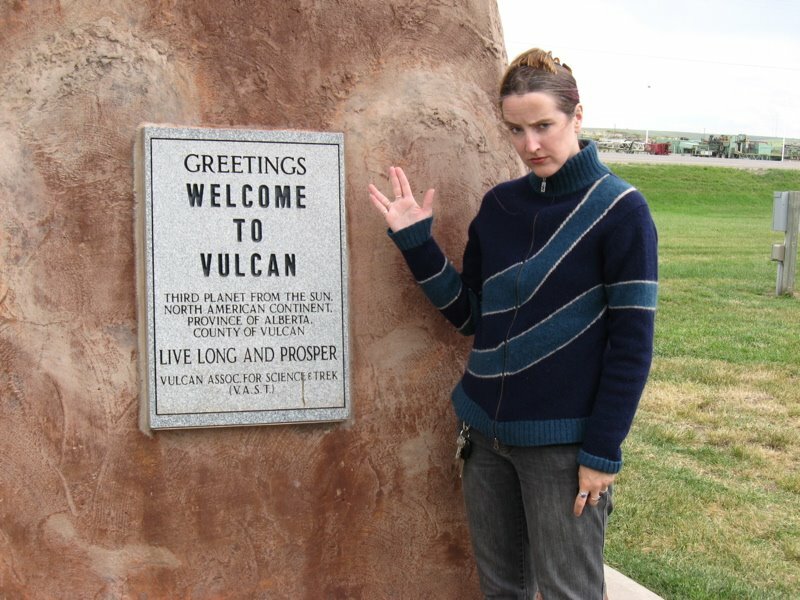 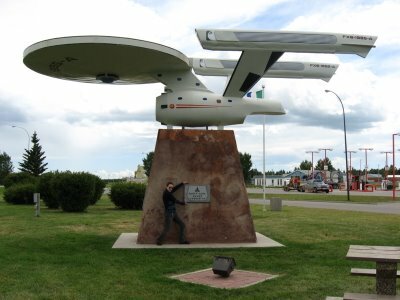 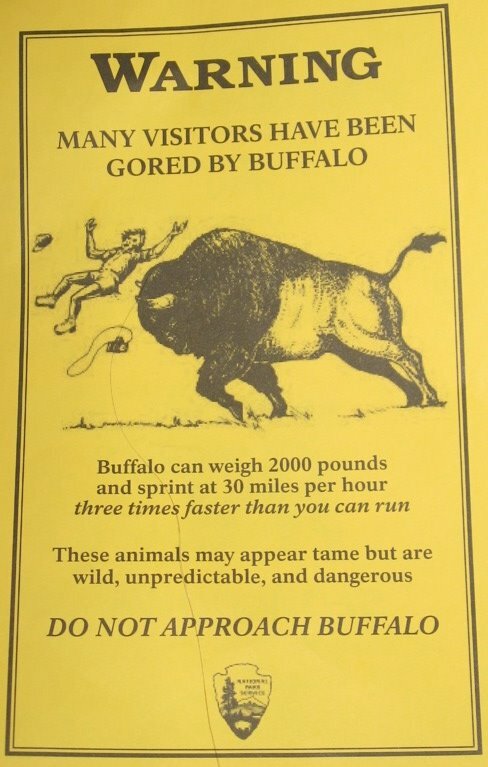 There is so much geeky goodness in the town of Vulcan, Canada, that I'll have to do this over a couple posts. 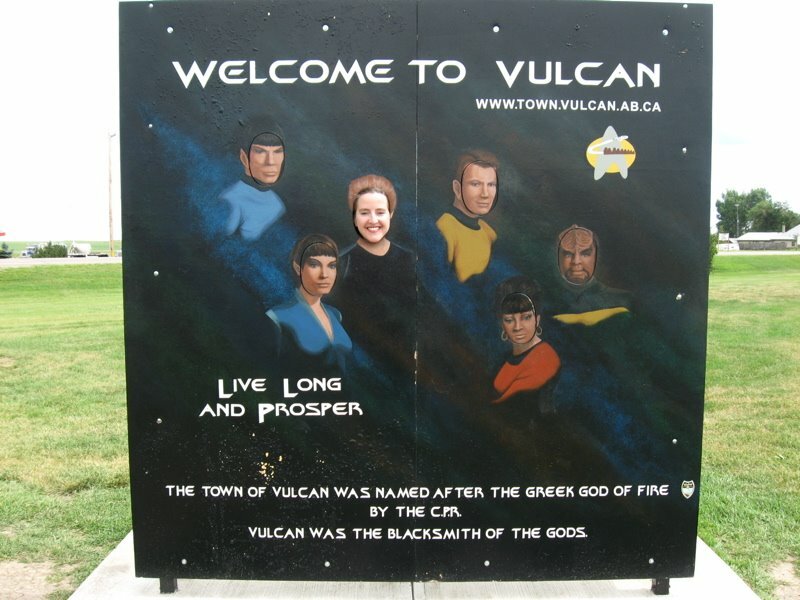 Named after the Roman god of fire by the Canadian Pacific Railway, in this century the town of Vulcan reached a point where it was not very prosperous. 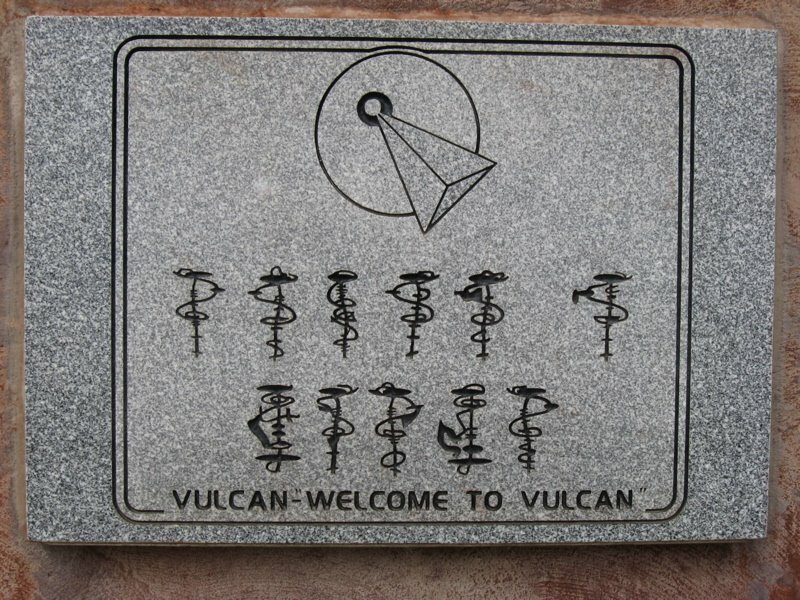 The town council decided something had to be done. 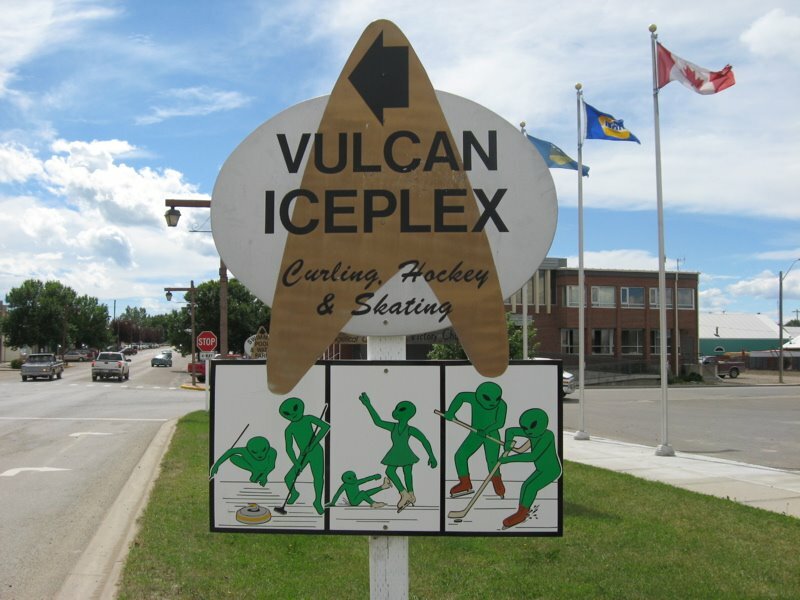 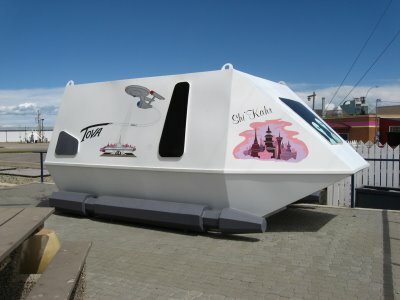 Because the Star Trek character Spock comes from the planet Vulcan, they decided to adopt a Star Trek theme for the town. Near the visitor center, a huge replica of the Enterprise hangs above a massive pedestal. Signs in three languages welcome visitors -- English, Romulan and Klingon. 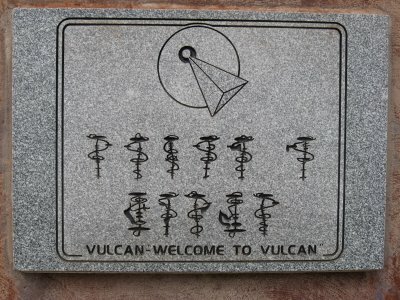 Another welcome sign invites visitors to take photos as members of a variety of Star Trek crews. All this Star Trek goodness, and we're not even inside the visitor center (built to look like a space station) yet! 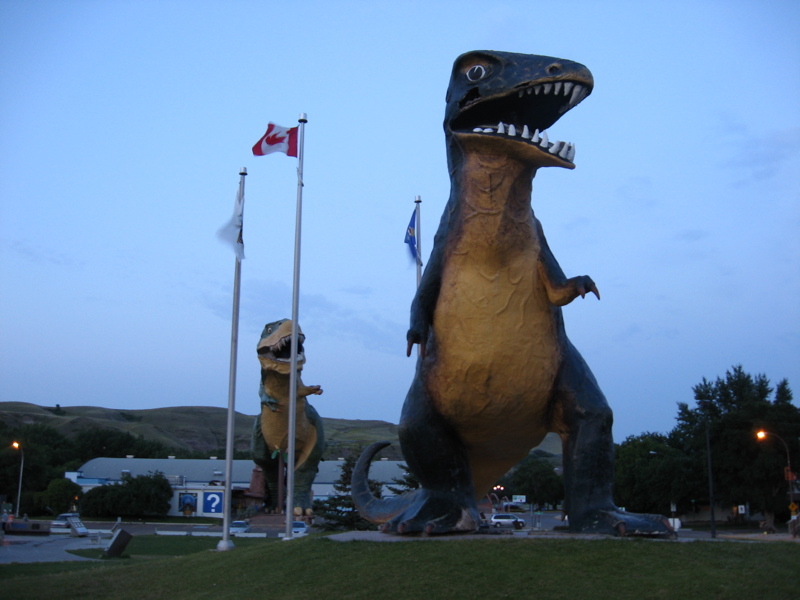 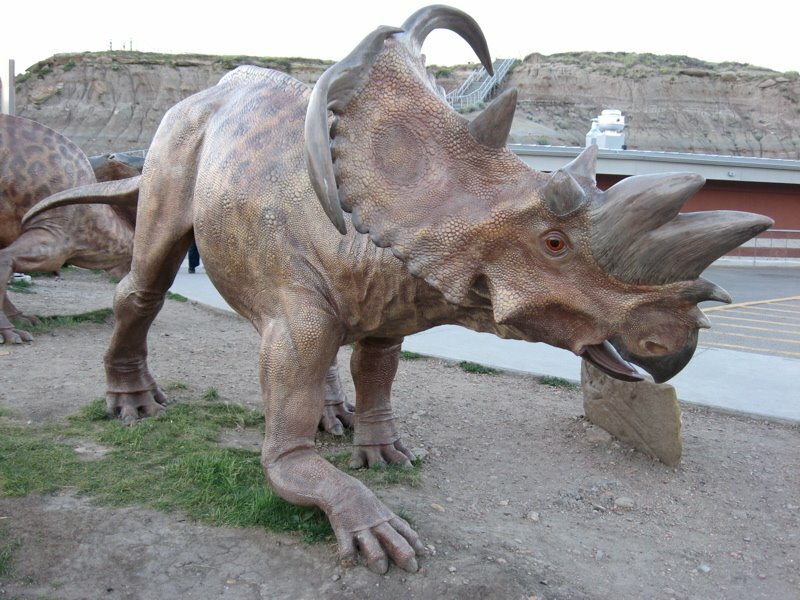 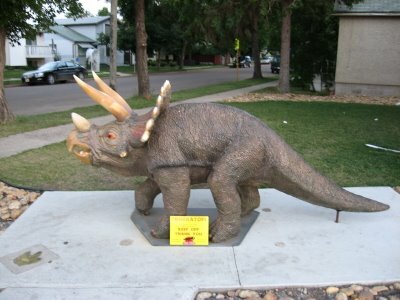 In the town of Drumheller, Alberta, where the Royal Tyrrell Museum sits, dinosaurs lurk on every corner. They loom outside stores, in parking lots, on signs -- everywhere. 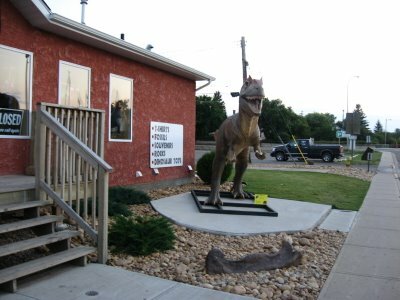 I had a great time wandering around looking at all the dinos, including what was boasted as "the largest dinosaur in the world." A towering t-rex stood above the town's visitor center, so huge that you can actually climb a staircase inside it for a view out of the mouth. 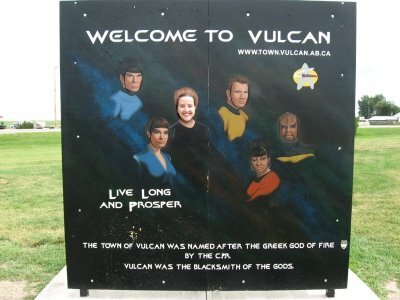 Of course, I had to do that! 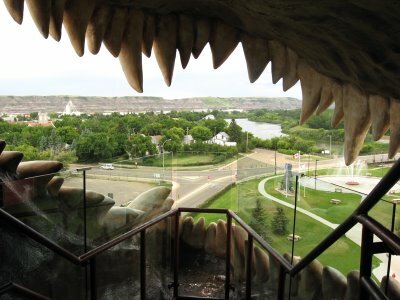 The view was incredible from up there, especially gazing out through all the teeth. 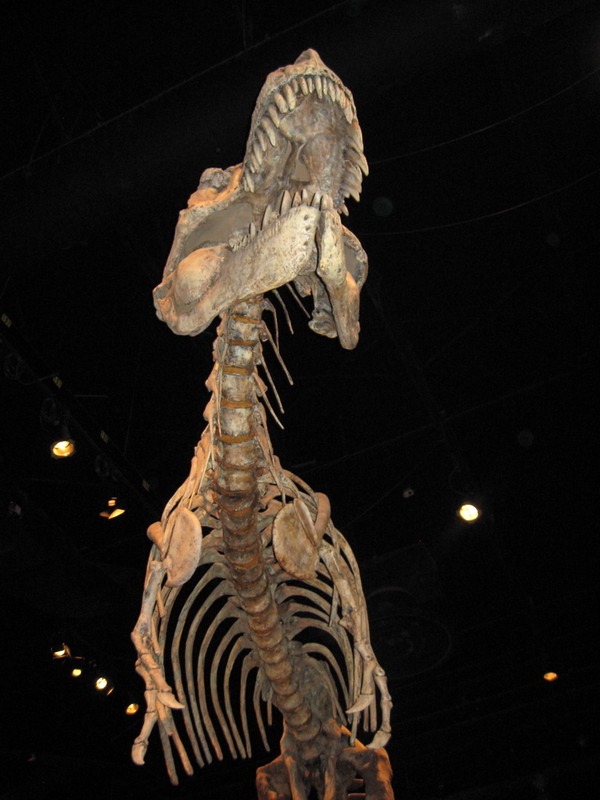 In Alberta, Canada, we went to the Royal Tyrrell Museum, a fantastic repository of all things paleontological. 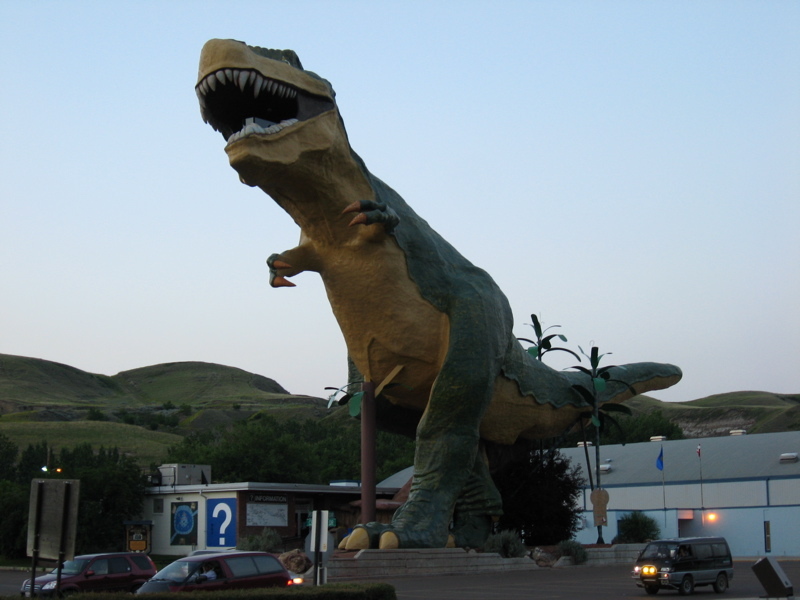 It's located in the badlands area of Alberta, surrounded by a multicolored desert landscape. We looked at a huge number of mounted skeletons and took a walk through time. 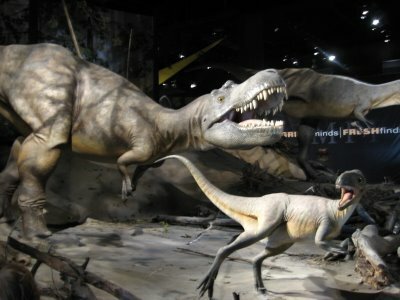 The museum winds you through early stages of evolution up through the last ice age, exhibiting skeletons, current research, and many examples of fossils. 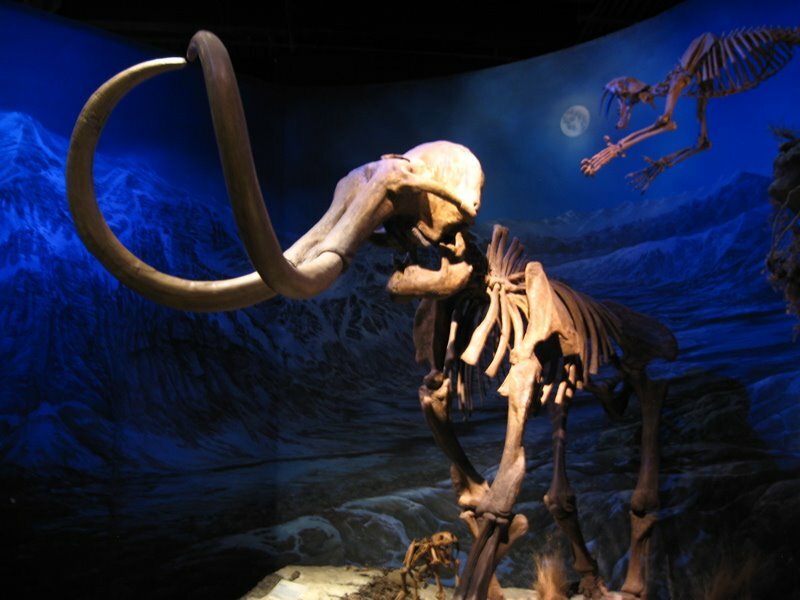 They spent a lot of time and detail on each era of prehistory, constructing vivid scenes to place the skeletons in. 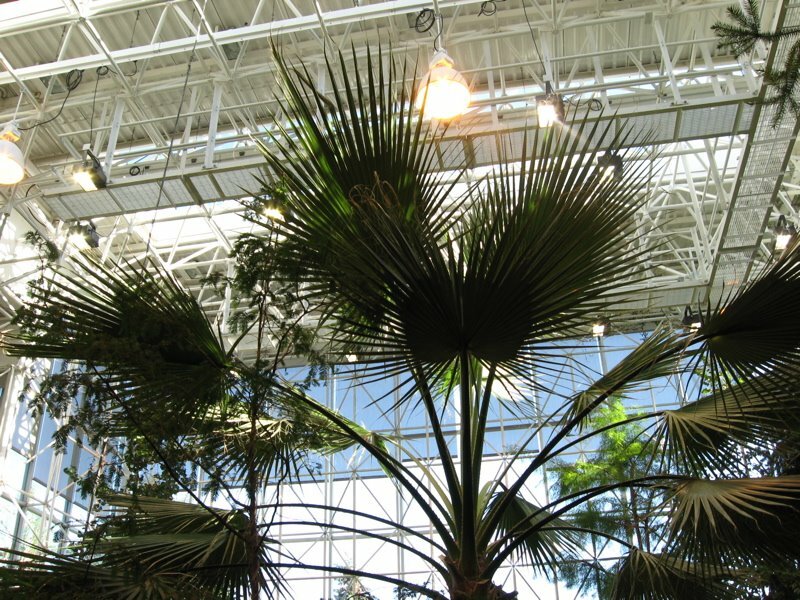 They even had a Cretaceous garden, full of plants that grew in the time of the dinosaurs! 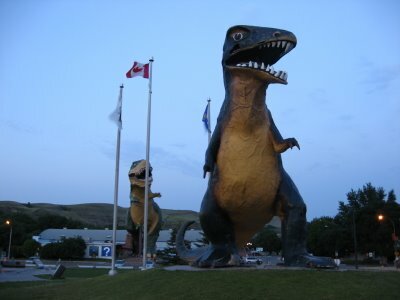 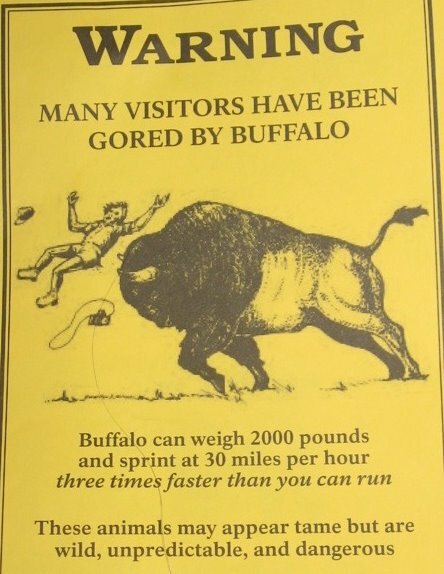 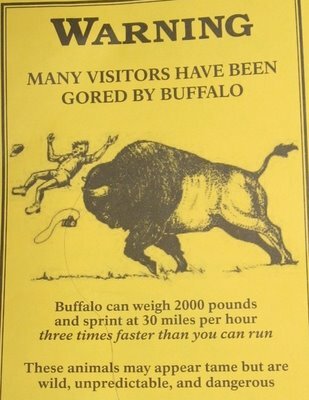 I've long wanted to visit this museum, so it was amazing to finally be there!